Democrat California Gov Candidate Jerry Brown Said “Mammograms are not Effective”, REALLY? When will California voters wake up, or is this state too far gone? How exactly is NOW, any other female or any one who has been affected by breast cancer voting for this fool Jerry Brown. First Brown’s campaign called Republican rival Meg Whitman a “whore” and now Brown has stated that “mammograms are not effective.” NICE, I though Jerry Brown was pro-choice? How does NOW endorse a man who is against mammogram screening? Can you imagine the reaction from MOW and the MSM is a Republican made such comments? The liberal feminist hicocrissy continues. You think the fact that October is National Breast Cancer Awareness month that maybe, maybe California voters might catch a clue? How does one make such a comment and actually have female votes or endorsements? The comment about mammograms came during an episode of “Firing Line” in October 1995, when Brown was a guest on the William F. Buckley Jr. show. He sat alongside feminist and commentator Susan Estrich during a discussion about government regulations that dealt with the death of the Clinton administration health reform proposal. This is the man that the National Organization of Woman is endorsing? A man who has stated in the past that mamograms are ineffective. Moonbeam Brown did not even want to allow the option for women to have one. WHAT! As No Quarter stated, will California voters ever wake up and realize that “Moonbeam” Brown has no chance of saving the states from its pending financial bankruptcy? Let alone, Brown hardly seems user friendly to woman and breast cancer screening. Meg Whitman, pro-choice might I add, actually has a business background and an understanding of how to get California out of its financial perils. It is unreal how a state could be so screwed up as to elect Jerry Brown to right the ship. Unreal indeed. 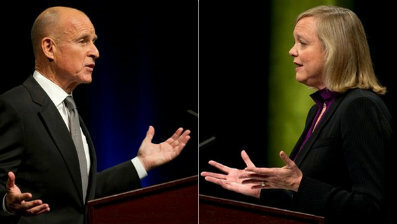 NOW endorses Jerry Brown, what does the “W” in NOW actually stand for? Remember just the other day after the Jerry Brown campaign was caught on a telephone recorder calling Republican California Governor candidate Meg Whitman a whore, we asked where was NOW and what would they say? Well NOW has now spoken and the hypocrisy is simply disgusting. As reported in the LA Times, one day after Jerry Brown’s campaign was caught calling rival Meg Whitman a whore, NOW endorsed Democrat Jerry Brown. That is correct, one day after his campaign uses a term like “whore” in reference to a female candidate, Brown gets the NOW endorsement. UNREAL. Actually, it is all too predictable for the Libs at NOW. As stated at Michelle Malkin.com, it’s not like NOW was ever going to endorse a Republican woman. Jerry Brown announced he has received the endorsement of the National Organization for Women, less than 24 hours after the emergence of a recorded message in which Brown can be heard in a conversation with advisors in which someone calls Whitman a “whore.” Coincidence? You be the judge. As if on cue, Brown’s campaign Friday released the endorsement from NOW championing Brown’s record on women’s rights. “As Governor, Mayor, and Attorney General, Jerry Brown has promoted and defended women’s rights,” said California NOW President Patty Bellasalma. I second the motion from Weasel Zippers, can you imagine, just imagine what would have happened if a Republican male candidate called a Democrat broad a whore? The California Governors race has been reduced to the Democrat Jerry Brown’s campaign calling republican challenger Meg Whitman a WHORE!!! Really. First we have the politically convenient sliming of Whitman with Gloria Allred and the sudden appearance of illegal immigrant maid Nicky Diaz who would risk deportation over trumped up allegations against Whitman. Now we have class personified of Brown’s campaign, males might I add, calling Meg Whitman a whore. As the Left Coast Liberal aptly states, and they should know because those Democrats are experts are whores. We are waiting for a comment from NOW condemning the actions of Jerry “Moonbeam” Brown’s campaign. After all, does the National Organization of Woman not try and stop such demeaning treatment of woman? Whitman’s campaign released the following, “The use of the term ‘whore’ is an insult to both Meg Whitman and to the women of California. This is an appalling and unforgivable smear against Meg Whitman”. NOW, we are waiting … Oh the hypocrisy.